This is our Signature Solo tap. A smaller design which just delivers Steaming hot water. Features a spring loaded twist button safety system. We specialize in Steaming Hot Water Tap solutions for all types of kitchens. 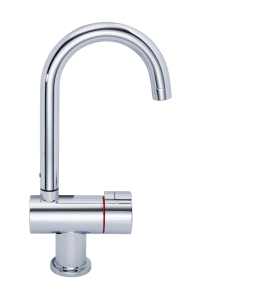 You can choose from one of our kits with various styles of taps or if you would like a more bespoke selection please contact us and we will do our best to give you the perfect tap and package for your needs.